Nano-Tank Catalyst: You can fit almost four NanoBalls in the same space it takes to fill one standard size bioball. Known as an excellent media for growing bacteria, the small size allows them to be used in almost any type of filter. You can place them in a powerfilter, canister filter, wet-dry filter or even directly into your tank. 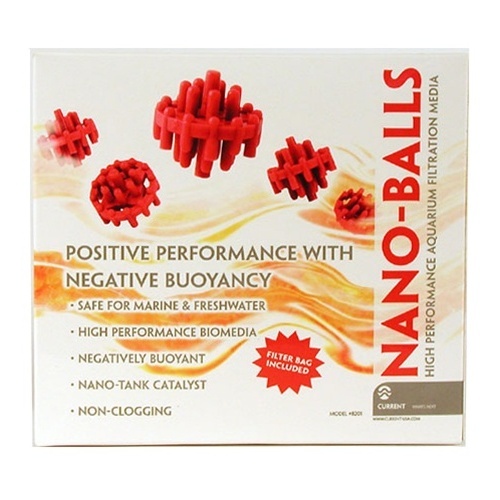 Each package of �" Nanoballs includes a polyester mesh filter bag to keep these buggers contained.Flowing Performance: The large spatial areas inside the bioballs allow water to flow through the media with ease, keeping it clean and efficient. While other medias clog and channelize, the plastic construction makes them non-clogging and totally inert. Unlike other plastic media, we made our bioballs negatively bouyant. So instead of seeing them float away, they can be placed in the area of your filter or pond that you want them. Easy to rinse and clean, they are lightweight; so they can be easily used on filter trays without breaking them!